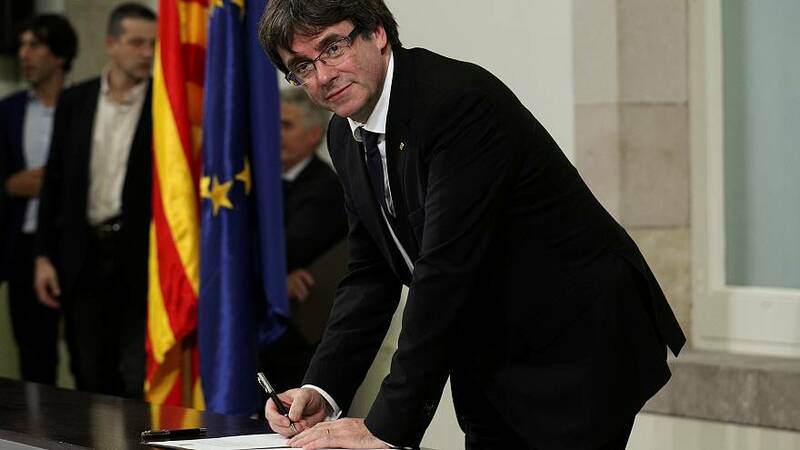 Catalan President Carles Puigdemont and other regional leaders have signed a declaration of independence from Spain after his long awaited speech before Catalonia’s parliament. But the move will not be implemented immediately allowing for talks with the national government in Madrid. The symbolic gesture was welcomed by some lawmakers but for others it fell short of a unilateral proclamation. Puigdemont had been under intense pressure from all sides leading up to his address. In the end he claimed the recent disputed referendum gave Catalonia the right to be independent. Madrid has vowed to block any move by Catalonia to break away and rejects the idea of any form of mediation with Catalan leaders who it accuses of of acting outside of the law. Spain’s deputy Prime Minister Soraya Saenz de Santamaria condemned the move. “After an intense day at the Parliament, Puigdemont and the secessionists intend to adopt independence in stages following the so- called Slovenian model. The reaction of the Spanish government should become apparent after today’s special Cabinet meeting.